Archive: Bill Volkmer's "Who's Who"
1) That's a "pothead" for the connection of an underground feeder cable to the third rail. The underground duct would end in a curved piece, coming out vertically. At the end of the duct, there would be a terminal block here a bolted connection would be made to short flexible cables that then connected to the 3rd rail. The connection block would be covered with many layers of electrical tape, then that concrete dome would be set on top. At switches and at grade crossings, underground cables would be used to connect from one piece of third rail to another. 2) At a guess, the third rail on this westbound track changes from the north to the south side of the track at this turnout. Somewhere behind the engine, the other end of the underground cable would come up to another pothead and there would a connection to the 3rd rail on the south side of the track (as is visible in the distance). There are a number of interesting 3rd rail details in this picture - the more I looked the more I could see. This is at what was Whitestone Junction, and probably taken from the wide footbridge that had led into the 1939 fair, and at this time just into the park. That bridge was completely torn down and replaced by a new one for the 1964 fair. 3) In the distance, the track curving off to the left is the remnant of the Whitestone branch. Note that it still has 3rd rail! 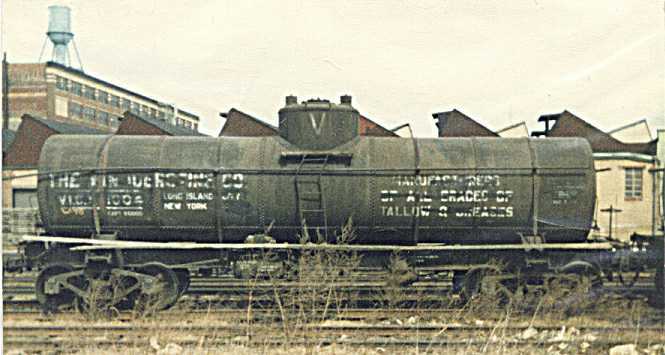 Until the diesel switchers like this one began to arrive, in the late 40's, local freight service in Queens and western Nassau was performed by DD-1 electric locomotives, in response to complaints (constantly amplified by the Long Island Daily Press) about noise and smoke from steam engines. So although MU operation had long ended on the branch, the yard and sidings on the stub still had third rail. By this time, it was probably not used any more, as the DD-1s had been retired from freight service as soon as the diesels came - before any steam power. By 1951, the DD-1's were on the way out altogether - the last straw was the introduction of Speed Control after the 3 bad wrecks - LIRR had to minimize the number of motive power units needing that expensive installation. 4) At the near end of the branch 3rd rail, you can see a small box on the ground. This would contain a knife switch, so that the branch 3rd rail could be shut off when not in use. Switches like this were provided at sidings, especially those that ran long distances into coal trestles, lumber yards, etc. 5) Just east of the pothead is a gap in the third rail, because of the turnout (which is probably a crossover between the two tracks). A gap at this location ensures that a contact shoe on a car or engine coming in on the crossover does not run into the side of the 3rd rail, as it converges with the main track. (An alternative solution is a "side approach", a sloping apron on a continuous 3rd rail past the switch points; LIRR once used such things in a few spots, but no longer). 6) There is a short length of 3rd rail under the engine cab. This looks like it has just recently been installed. The protection board brackets look freshly galvanized. Remarkably, it seems to be fed by a cable just laid on the ground, with a few scattered boards as protection. Wonder why?? 7) Along the left side is another "feeder rail", on concrete supports, carefully boxed in on all sides. No pothead for connections to it appear, but there must be some. In this picture (LIRR engine #314) note the object in the foreground - unique to the LIRR; this is a "feeder rail". Where other properties might use a copper cable, overhead or underground as a feeder, LIRR used this arrangement. It is a piece of third rail, not mounted beside a track, but mounted on concrete piers, and boxed in with wood. These were used in a couple of places where there was single track, but a need to feed power from a substation over more than one 3rd rail. 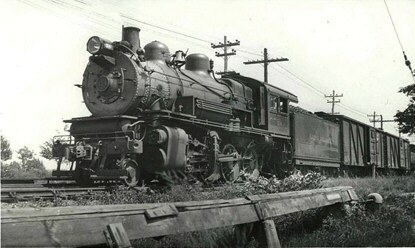 I suspect that this picture is not on the Main Line at Mineola, but rather on the track that ran south from Mineola to Hempstead crossing, where it connected to the Hempstead and Central branches. The crossing was a load center - with Hempstead branch trains plus the Mitchell Field shuttle), but the nearest substations were at Mineola, West Hempstead and Hempstead, so feeder rails were used to provide additional conductivity to the Crossing. That track from Mineola to Hempstead Crossing is now long gone. Branching off of it was a spur to the Garden City Waterworks. Also gone is a connection from Hempstead Crossing to West Hempstead. In the late 19th Century, after the general merger, many trains to the Oyster Bay Branch and points east on the Main line were routed from Floral Park through Garden City, then up this track to Mineola instead of using the Main Line. Some years ago there still were a few rails in the street crossing between the Mineola substation and Nassau tower, remnants of connections used in this routing. Later the LIRR's battery cars ran from Mineola through the Crossing, then down the West Hempstead branch to Valley Stream. When the West Hempstead branch was electrified, so was the connection from WH through Hempstead Crossing to Mineola, and trains could be run in a loop, going out via Valley Stream and back via Mineola, but I don't think this lasted long. this was done was perhaps to run the transmission line along the main line. A transmission line with tall poles running through Garden City might have roused some influential nimbies! Also, there was the possibility that eventually the Main Line would be electrified; and in addition, the transmission line also continued to Farmingdale, to feed a substation there that powered the Huntington-Amityville trolley. The shop switchers 320 and 322: They had batteries, and could run either from third rail or the battery. The transfer tables had third rail, but the tracks inside the shops could not, hence the battery. Power to the transfer table, both to move it, and for its 3rd rail, was collected by a trolley pole mounted on top of the table’s cab. The battery could be charged when the engine was on 3rd rail. The controller in the cab of the 320 and 322 was a drum type, similar to a streetcar K-type, directly controlling the motor current. Because space in the cab was limited, the controller was mounted at right angles to the usual position – the operator facing the controller would be facing the side, rather than the end of the engine. As a result the positions of the reverse handle on the controller were not clear. Big arrows were painted on the top of the controller to show which position of the handle would move the engine in which direction! This is more a Pennsylvania RR/IRT story, but in LIRR territory. At an early date, the IRT learned that any time there is a water main break, the water will end up in the subway, at a rate beyond the capacity of the normal drainage pumping plant. About 1907, the IRT built a pump car, using the underframe of a fire-damaged 1904 Composite passenger car. Like all those cars, it had the usual Van Dorn improved link & pin couplers, like all the el cars. Some time about 1927, there was a huge downpour in Long Island City, and the water ran in to the portals of all four Penn station tunnels, flooding them and blocking all movement. 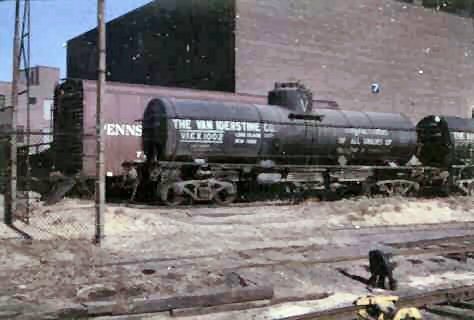 Some years ago, the PRR Technical & Historical Society news letter had an article describing how Pennsy managed to turn and service all their trains, including long distance trains with sleepers and diners, without access to Sunnyside Yard! The late Bill Eaton, who worked 49 years for the IRT/NYCT and later for LTK and MTA told this story. He was sent with the IRT pump car to help the PRR. 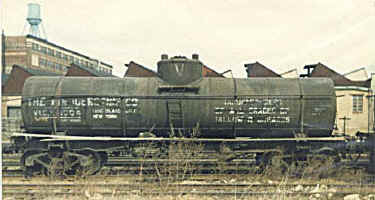 (The BMT pump car was also borrowed by the PRR). 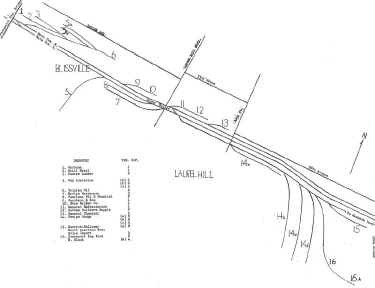 At that time there was a little 2-car inspection shop at Hunterspoint Ave, with the track connected to the IRT at one end and the railroad at the other end. The pump car was towed over the Queensboro Bridge to that point, to be picked up by the RR. The crew arrived with a DD-1, took one look at the pump car and exclaimed “Link & pin couplers! That’s illegal! We can’t take that!” Bill had to point out – look you have a flood, I have a pump car - let’s get together on this! One error in Bill Volkmer’s notes about me (wow! How can I live up to what he says): I was born about a train length from Jamaica Station – Jamaica Hospital at Van Wyck & Jamaica Aves. Moved to New Haven when I was 1, and my earliest recollections are train watching at New Haven station. But when I was 5, we moved back to the Sunrise Homeland, living in Bellaire at first. The feed must have gone by third rails or feeder rails from Mineola to Hempstead crossing. As I remember, the single track on that stretch also had negative feeder rails – two rails in the middle of the track, only about a foot apart, and bonded at the joints. This would provide a parallel path for the return current. Spaced like that, they could not be guard rails, just electrical feeders. Similar rails were provided on the Rockaway Branch, to better feed through the long stretch from Substation 3 at Woodhaven Jct to SS 5 at Hammels. Hammels SS 5 originally also had a large storage battery. When traffic was light, power could trickle down the transmission line from LI City, through the rotary converters and into the battery. Then on a sunny summer day, with huge crowds in the Rockaway's, if a thunderstorm moved in and everybody decided to head for home at once, the battery could meet the demand of sending all the trains out in short order. June 24, 1968, Car 9002 made first appearance in Budd's production line - at the station where assembly of the underframe began. (9002 was produced ahead of 9001, perhaps because they wanted to start with an "A" car). Sep 3, 1968: 9002 in the production line station where the floor, sides and roof were assembled. 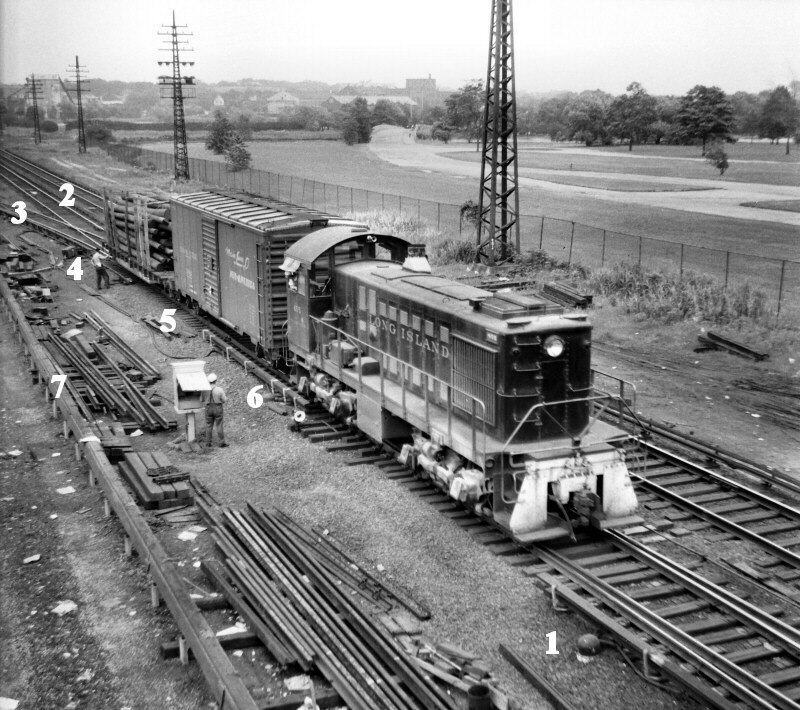 Oct 17, 1968: 9001-9002 arrived at LIRR (shipped Oct 16), overnight via RDG from Budd to North Philadelphia, PRR from N. Philadelphia to 30th St, then via NE Corridor through Penn Station to Harold interlocking. Held at Harold through AM rush, then to Dunton Inspection shop at Jamaica. This was the pattern for following cars until acceptance processing was moved from Dunton to Shea Stadium. Oct 21, 1968: 9003-04 arrived at LIRR. Note these are the first days these cars were recorded as being at LIRR. In each case, they shipped from Budd in the evening of the previous day. I don't think the cars were displayed more than a day or two at any one location; they were probably moved from one spot to another frequently. (Hempstead, Port Washington, Long Beach, Penn Station, and Babylon) Info: Matt Kobel [October 17, 1968 1st M-1 Pair displayed at Sunnyside; October 28, 1968 1st M-1 public displays] 1968 PRR Chronology Report. A driving force in that period, perhaps, was that Nelson Rockefeller was running for election as a Presidential candidate that fall, and it was made clear to the MTA that it was important to get as much exposure of the new cars before election day. This began on the morning after the first pair was delivered from Budd to Harold interlocking, and parked on the interchange siding just east of the tower until after the AM peak. Crews of westbound trains were told to announce to passengers that the first of the new cars could be seen there! As the first few cars came in, most of them would be involved in pre-acceptance testing, installation of shoe beams, etc, so this static display would have been concentrated in late October. Somewhere in that period there was a formal media event at Jamaica station, with a speech by the Governor followed by a trip to Woodside and back. All this had to happen before Election Day. Back in June, there had been a summit meeting of MTA Chairman Ronan with officials of Budd and GE at which it was laid down that 14 cars MUST be at the LIRR by the end of October (that was the original contract schedule, but some delays had arisen). Budd rose to the occasion. They worked out an agreement with their union (UAW) that they would not put their usual production bonus plan into effect until the 15th car, but would pay a premium on the first 14. They plastered the plant with stickers showing a pumpkin with the legend "14 by Halloween", as motivation. These came in two sizes - on about 3 inches and one about 10 inches. Inside the electric locker door of 9014 was one of the large ones. They did succeed in meeting this schedule, but the down side was that a number of problems had to be overlooked until later. The LTK lead inspector at Budd's plant used to tell them that "those pumpkins had better turn into coaches!" Most of the problems, which led to a big retrofit program, were not with Budd's design or work, but with the systems supplied by their subcontractors - especially G.E., WABCO and Motorola. Cars 9017 and 9022 were shipped from Budd’s Red Lion plant, where all the M-1’s were built, to Budd’s test lab at the Hunting Park plant, where one was used for the specified compression (“squeeze”) test and one for the climate room test (see below). When the tests were over, they were shipped to the LIRR as a miss-mated pair. Because of the routing to and from Hunting Park, this pair arrived at the LIRR with 9017 at the east end, not conforming to the other M-1’s (even number east, as in track and train numbers). Shortly after arrival, this pair was turned on the wye of the Belmont Park branch. While these cars were at the lab, cars 9018/9019 and 9020/9021 were shipped from Red Lion to LIRR also as miss-mated pairs. Some time later, the LIRR gathered all three of these pairs together and correctly mated them. 58462 feet, a little over ten miles would be just about right for that location, measuring from Long Island City via the Montauk Branch. Jamaica is 9.3 miles. If i remember right, mileposts East of Jamaica are measured via the Montauk Branch, not via Woodside, which would be a little further. Coincidentally, the distance from Flatbush Ave to Jamaica is also shown as 9.3 miles. For example, the original PRR line between Trenton and Philadelphia swung through the middle of Bristol, with many grade crossings. About 1909, the PRR built a cutoff bypassing Bristol, with grade separation, and shortening the line. Mileposts 66 and 67 are 4000 feet apart. The chaining in such a case will have what is called an "equation". At some point on the drawings there will be a line drawn across the line with two chaining numbers listed, one for the chaining up to that point, a different one for the chaining going forward. The Van Iderstine trucks always looked very elegant outside - like UPS trucks today, always seemingly freshly painted and waxed. They were a very dark blue, almost black with blue stripes. But, when they stopped in front of the local butcher shop and opened the door to pick up the scraps - the inside was something else!